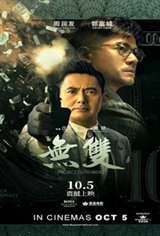 In spite of difficulty, sometimes, in catching the meaning of the subtitles, I still found it an intelligent and well plotted suspense/thriller. Good acting. Gripping. Not just another counterfeiting, shooting, straight forward violent film. Enjoyed it! Excellent plot. Don’t leave early. Very well done job that reminds me of “Shattered Island”. After the movie when I thought about it, in fact, there were subtle hints throughout the movie especially towards the ending. It is harder for audiences who rely on the subtitles though. Great acting. Like to watch it again.